If you mix mod and modern together, this look is what you've got. 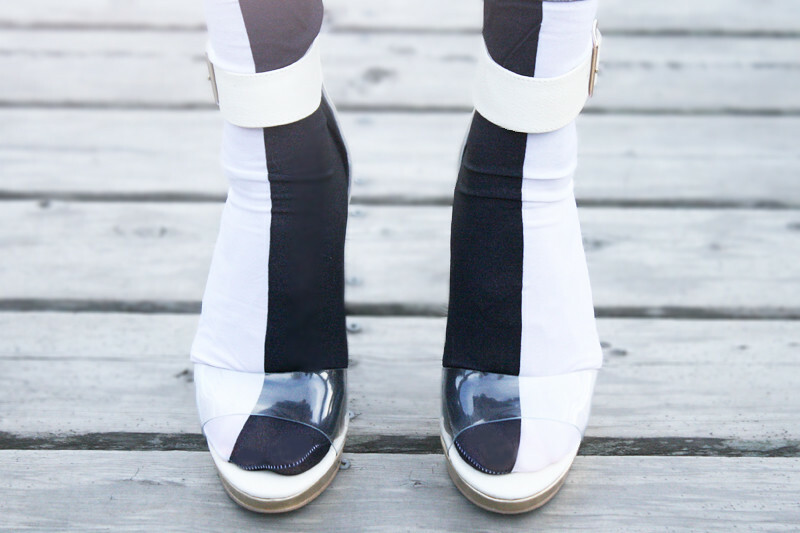 Symmetrical black and white pattern or print always resemble mod to me, just like these awesome half and half socks! And what's a better way to show them off than with a pair of transparent lucite heels? Oh, and the dress... I simply looove it! This dress gifted to me from Choies has the most awesome strappy cage design and it can be easily dressed up or down, it's perfect! Strappy cage dress c/o Choies. Two tone socks from ASOS. Transparent lucite heels from F21. Box clutch from my work Sway. Those socks are amazing, and you're right--so mod! I...................... LOVE THIS! The socks with those shoes, and that dress! I love it all! Very well done. Best style I've seen today. This dress is just so cool. I love the cage detailing at the top. Very unique and fun! Such a neat mix of mod and modern in this outfit! I just arrived in your blog, this outfit is wonderful, I love ilbianco black and beautiful glasses too <3! Hi there, mine is a small. I usually order the smallest size possible when it comes to shopping online because I am very petite and small. I'm only 5'2" and size XS/0. So so pretty! Lovely dress and those heels! Your dress is amazing! Wonderful outfit! but I think that these open shoes should be worn without socks! amazing look,I love the dress! + following now on bloglovin, have a great sunday! Oh!!! Your dress is soooo beautiful! I really love the detail of your dress! So chic and modern!